I have no idea why but in the last seven days I have had four people, all from different parts of my life, ask me questions about coming to Korea. I fully acknowledge that I am not an expert on all things (or anything) Korean, but I have about eight months worth of knowledge that I did not have when I was starting the job hunt. The first thing to do if you think you want to come to Korea to teach is consider if Korea is the right place for you. You can make and save a lot of money with relatively little effort in Korea and all you need to have is a university degree, a passport from one of seven eligible nations, and you must be a native English speaker. That said, if you have a B.Ed then I would recommend doing more research because there are a lot of places where you can teach ESL (Hong Kong, Taiwan, Dubai . . . ) and make comparable, if not better, money than in Korea. Let’s assume now that you’ve decided that Korea is right for you. Now you have to decide if you want to teach in the public school system or in a private cram school, called a Hagwon. There are pros and cons to each. I think that the pay scale for public schools starts a little lower but public school teachers get A LOT more holidays. In contrast, Hagwons often offer slightly better salaries but most of them will squeeze every contracted hour out of their employees in order to get their money’s worth. (I lucked out in this department; I have awesome hours.) If you enter the public school system then you will probably be given training, which is a great way to ease into the job and to meet fellow teachers. If you’re working with a hagwon then there is a very good chance that you will be teaching students within 16 hours of stepping off the airplane. There are a lot of pros and cons to each side. Ultimately, for me, timing was the deciding factor. The big hiring season for the public schools only happens two times a year and it didn’t mesh with my desired schedule. I am going to talk about hagwons from here on in, as that’s the only thing that I know much about but the principles are generally the same. It might seem like a good idea to just get on a plane and find a job upon landing in South Korea. However, E2 visa regulations require you to have an interview in your home country if this is your first time teaching in Korea. It is also worth noting that in Korea your work visa is attached to your job, not to you. If you quit or get fired from your job you must leave the country. This is a pretty intimidating prospect and if it’s a deal breaker then you might want to look into other countries. Japan, for instance, grants teaching visas that are independent of specific jobs; if you leave one job you can stay in the country and look for other work. Since you’re likely conducting your job hunt from home then you’ll need to go through a recruiter (even if you’re applying to the public school system). Recruiters are businesses that are hired by schools to find teachers. As a teacher you should NEVER pay recruiters. You will have to pay other costs associated with your visa and work documents, but none of that money should go to the recruiter. After you contact a recruiter they will get in touch with you to conduct a pre-interview. They’ll ask all the questions you would expect to be asked in a teaching interview: Why do you want to go to Korea? What is your experience working with children? What would you do in situation x? Blah blah blah. Then they’ll start sending you job opportunities via email. It’s a good idea to work with a few recruiters. I think 3 or 4 is a good number; too many can get confusing and overload your email inbox. Some recruiters will be very choosey and will only send you jobs that match your criteria. Others will just send you anything they have. For example, I specified that I didn’t want to teach Kindergarten and I wanted to be in a city with more than 500 000 people. I worked with one recruiter that sent me multiple kindergarten jobs in rural Korea. (I ended up dumping that recruiter mid job-search.) Remember that recruiters are only paid once they successfully match you with a school. Some recruiters will push you towards accepting a job and it’s important that you stand up for yourself if you are not happy with the jobs being presented. I don’t want to name specific recruiters on this blog but if anyone wants to know the companies that I worked with then feel free to send me an email. This post is obnoxious and long. 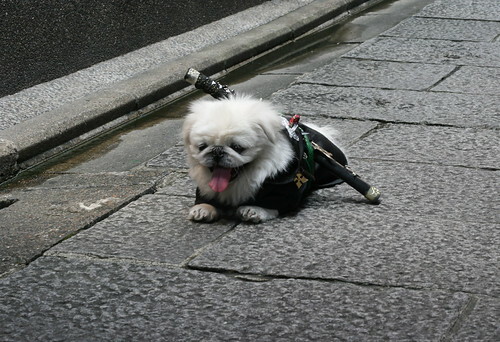 On the plus side, at least you're not a samurai dog! Once you get a job in your inbox that seems like a good fit then the recruiter will set up an interview. If you’re in North America then you need to be prepared to do interviews at all times of the night. The earliest interview I had was 11:30 pm and the latest (or earliest?) was at 6:00 am. That’s just the harsh reality of time zones. The interview with the school can be a really funny experience. Often the person conducting the interview will speak limited English; that’s why the recruiters do pre-interviews. The schools really want to hear your accent and make sure that you are a real person. I have friends who were asked things like “what is your favourite colour?” in their school interviews because that was the extent of the interviewer’s English. Don’t be too nervous; if the school is interviewing you then you already have a good chance at getting a job offer. Do remember to ask questions during your interview. Ask about housing. How far is it from the school? What is public transportation in the area like? Ask about the school. How many teachers are there? How many of those are foreigners? What is the work atmosphere like? Ask about training. Ask about how long the school has been in business. Ask for the contact information for the current foreigner. Any school that is worthwhile will not hesitate to provide that info. (Although it’s normal for them not to have it on hand. They might have to send it to you through the recruiter later.) Ask the foreign teacher everything I mentioned above and also ask him/her about pay. Does the school pay on time? Is it easy to talk to management? Did the school help him/her with getting setup in Korea? Why is he/she leaving the school? Speaking with a foreign teacher at the school is not guaranteed to avoid problems in Korea, but I think it’s the best you can do. So let’s assume that several schools want you. Congratulations, you’re a superstar! Now you get to be picky. Read the contracts that they send you carefully. Don’t accept anything that doesn’t include National Health Insurance (paid 50/50 by the employer and the employee) and National Pension. These are required by law and if the school doesn’t offer them then something might be fishy. The contract should also talk about your housing. It’s a good idea to make sure that air conditioning is mentioned. It seems finicky, but I can tell you that I would not have survived July and August in Korea without my A.C. The contract should also talk about airfare. You should be given round trip airfare to/from the closest international airport. If you have any questions or concerns about anything in your contract talk to your recruiter. I found that this was the point when I started feeling pressure from recruiters to accept jobs, but remember: you have to live with the contract that you sign for twelve months. It’s a lot easier solve contract issues beforehand through a recruiter than it is to deal with issues in Korea with school managers who do not speak English. Once you accept a job then you get into the visa application process. I won’t get into that too much because this post is already inexcusably long. I write a bit about visas here and tons of info can be found elsewhere on the internet. Eat your Kimchi : a blog by a Canadian couple teaching in public schools. They make videos about everything from applying for public school jobs to ordering McDonalds in Korea. Dave’s ESL Cafe : A place to look for jobs. There is also an “idea cookbook” where you can get ideas for games, discipline ideas or other general teaching tricks. The forums here can be useful but I find them to be overrun with gross trolls. Roboseyo : This blog is run by a guy who has been in Korea for a long time now. He offers really accessible and readable advice on how to make your time in Korea a positive experience. Scroll down the right side of his blog to see popular/uesfull entries, as well as a good list of noteworthy K-blogs. Roketship: an online comic strip about an expat’s life in Korea. I was planning on adding more links but I’m tired. And I know that you’re all very capable of Googling. If anyone has more questions send me an email or leave a comment. I am by no means a sage, but I have gone through the Korean job hunt once and I know how intimidating it can seem.